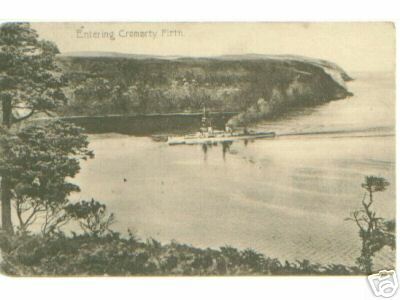 This is from an old postcard of about 1910 on what would apear to be a very calm day. This is apparently HMS Bellerophon a battleship launched during 1907 and Commissioned in 1909. HMS Bellerophon was built at Portsmouth Dockyard and a veteran of the Battle of Jutland. She was scrapped in 1923. Another nice shot - sadly not HMS Bellerophon, however, as she had two masts, one immediately in front of each of her 1st and 2nd funnels, with no mainmast further aft. I suspect this is HMS Neptune. This ship has plenty of room for a main turret between the two funnels, and room for another one between the 2nd funnel and the mainmast which can be seen further aft, partly obscured by smoke. Neptune had a single turret fwd, a single turret offset to port between the two funnels (so visible in this shot), a single turret offset to strbrd between the 2nd funnel & the mainmast (so less visible from this angle) and a pair of superfiring turrets aft of her mainmast. As with all the modern heavy ships, she received significant and continuous modifications throughout her career. A more detailed scan of this photo might enable both her identity to be confirmed, and a reasonably accurate date range to be established. I don't think this ship is HMS Bellerophon or HMS Neptune. The reflection in the water suggests that the mainmast IS forward of the rear funnel but it does not show against the dark water behind. The dark object aft of the rear funnel shows a short reflection and is therefore most likely to be the aft island searchlight structure. If you enlarge the photo, the rear funnel appears to be much larger front to back, which would identify the ship as perhaps from the class following the Bellerophon class, probably HMS Vanguard, which exploded on 9th July 1917 in Scapa flow with the loss of all but two of her crew. The other two ships of the class had white funnel bands, Vanguard had a red band on the rear funnel which the photo appears to show when enlarged. The built-up bridgework would suggest a date reasonably near to the start of World War I .... but I could be wrong! !